The true story of the 47 ronin (masterless samurai) of the province of Harima is probably the best-known story of the valor and ideals (the Code of Bushido) of Japan's famous samurai warriors. At the heart of Japan is the samurai code of "bushido." Bushido literally means the "Way of the Warrior". It was the code, the way of life of the Samurai : courtesy and courage, sincerity and self-control, honor and loyalty. The story begins in 1701. The Shogun Tsunayoshi lived and ruled from Edo (known today as Tokyo), while the Emperor lived in Kyoto. To show respect to the Emperor, Tsunayoshi sent gifts and envoys to Kyoto for the New Year's celebrations, and in return, the Emperor sent his own envoys to Edo in March. To receive the Imperial envoys, Tsunayoshi appointed two young daimyos (feudal provincial lords), Naganori Asano-Takuminokami, The Lord of the Castle of Ako in Harima Province, and Munehare Date, Lord of Sendai to act as hosts during the forthcoming visit of a member of the Imperial Court in Kyoto. Because the daimyos were inexperienced in entertaining high born guests, the Shogun appointed an elderly high official named Yoshinaka Kira-Kozukenosuke to assist them. But Kira disliked Asano and treated him with malice and disgraced his honor as a samurai. Kira used every opportunity to publicly humiliate Asano. After months of abuse, Asano's tolerance was gone. 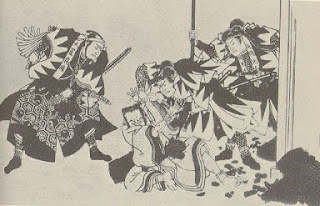 On March 14, Asano drew his sword in the Edo Castle and struck Kira cutting him on his forehead and shoulder. 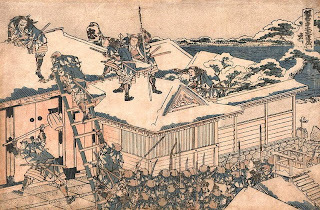 It was strictly forbidden to draw one's sword within the Edo castle at that time and Asano was immediately arrested. There was also a law which punished both samurais involved in a fight so both Asano and Kira were expected to be punished. However, while Kira received no punishment, Asano was sentenced to death by seppuku (hara-kiri) on the very same day. By law, when a samurai committed seppuku, his castle was confiscated, his family was disinherited, and his 321 samurai retainers were ordered to disband, thus becoming ronin or masterless warriors. Oishi Kuranosuke, Asano's Chief Councilor, decided on a plan to avenge Lord Asano's disgrace by killing Kira. Only this would restore Asano's rightful honor. The men split up to conceal their plans from Kira, who naturally suspected that Asano's retainers would try to get revenge against him. Oishi went to Yamashina, a suburb of Kyoto, where he earned a reputation as a drunken gambler, to deceive the Shogun's police and Kira's many spies. The ruses worked. Kira and his allies finally relaxed their suspicions of Oishi and his men. Almost two years after the fateful incident, at a secret meeting, Oishi and the other 59 ronin decided that the time had come to move against Kira. But Oishi would allow only 46 of the men to participate with him in the attempt. 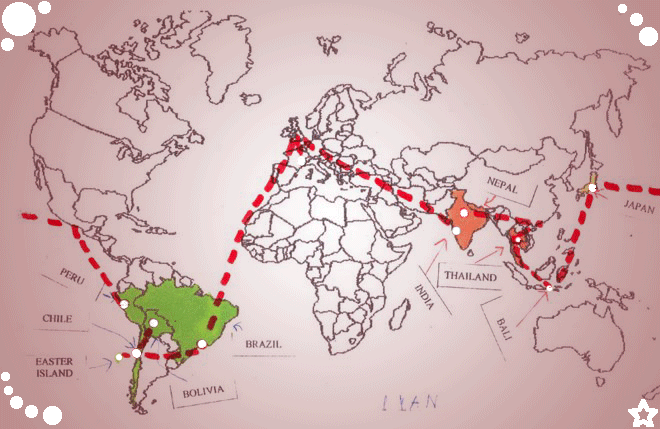 He sent the other 13back home to their families. 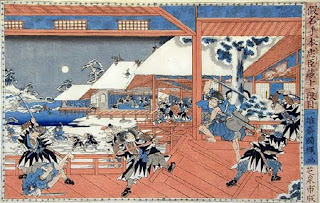 One by one Oishi and his men infiltrated Edo, and on a snowy winter night of December 14, 1702 the 47 ronin attacked the mansion of Kira while he was having a tea party. In the great battle that followed, the 47 ronin stormed the mansion, killing all of Kira’s guards without a single loss of their own. They found Kira hiding in an outhouse. The ronin brought Kira to the courtyard and offered him the chance to honorably commit seppuku. Kira refused, so Oishi beheaded him with the same sword that Asano had used to end his own life. Then the 47 returned to Asano's grave at Sengaku-ji Temple and set Kira's head before it, declaring their Lord's honor redeemed. Prepared to die for their deed, Oishi sent two delegates to the Magistrate of Edo, informing him of what had been done and telling the official that they would be waiting at the Sengaku-ji Temple, awaiting orders from the Shogun. The Shogun Tsunayoshi, instead of being angry, was deeply impressed with the loyalty demonstrated by the 47 ronin. Tsunayoshi was faced with a dilemma. Should he spare the 47 ronin in recognition of their great display of bushido and their defense of their Lord Asano's honor, or should they be punished according to the law. After 47 days of deliberation, Tsunayoshi ordered that Oishi and 45 of his men were to execute themselves not as criminals but as honored warriors. The youngest of the ronin, who had been sent to Ako with the news of Kira's death was spared from the sentence. On February 4, 1703, Oishi and the other 45 ronin all committed seppuku simultaneously, dignifying themselves in their valiant sacrifice. Upon their deaths, the 46 ronin were buried side by side next to their master at Sengaku-ji Temple. Each year thousands of Japanese visit the gravesite of the 46 ronin at Sengaku-ji Temple to pay homage to the honor and loyalty of the 47 ronin and their dedication to the code of bushido. The avenge of the Ako Gishi has been made into various plays and is now commonly called Chushingura (the Story of the Loyal Retainers). It is a popular tale and one that still touches the Japanese heart even after 300 years. The chivalry of the loyal retainers and the themes of Gi (justice) and Chu (loyalty) are still highly esteemed by the Japanese. The Japanese national legend has been adapted for the big screen at least six times. Keanu Reeves will star in a new film version of the 47 ronin. 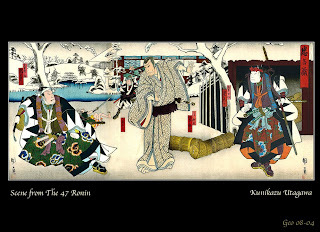 Well done site and excellent summation of the 47 Ronin Story. So, what Do you think about the new film with Keanu Reeves? I haven´t seen the film yet and I didn´t know it was released! Cannot wait to see it! Have you seen it? Is it good? I would really like to see the old movies as well. Bonjour madame, je suis une de vos anciennes éléves, et c'est toujours un plaisir de revoir ce blog et tous ces traveaux. Merci de nous avoir fait découvrir toutes ces cultures.